Leftovers from nuclear reactors contain the element neptunium. To safely store the waste, scientists need to know more about how to control neptunium's chemistry. Knowing the stability of different oxidation states is central to chemical control. The +3 oxidation state is generally inaccessible in aqueous (water-based) solutions. 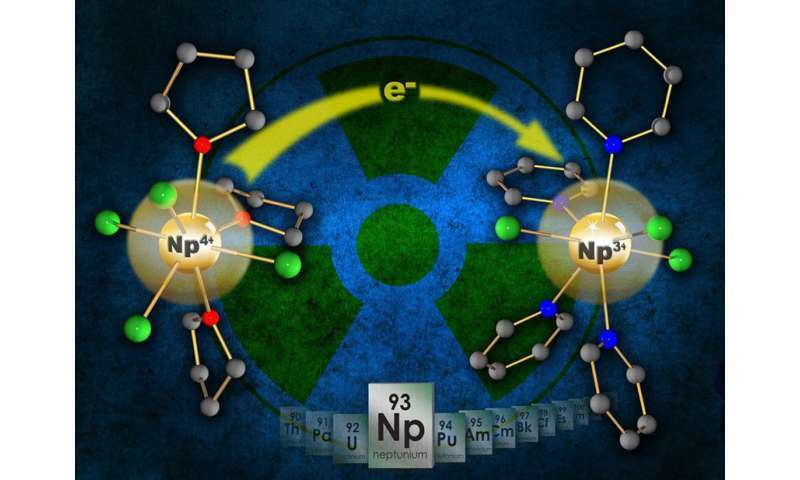 Researchers devised an easy way to access neptunium in the +3 oxidation state. Using this method, the team discovered new neptunium properties. They also found out how neptunium's stability in this oxidation state compares and contrasts with plutonium. Neptunium metal is scarce and hard to obtain. Thus, it is difficult to analyze and fully understand, but scientists need to know more as this metal contributes to nuclear waste toxicity. Now, researchers may have a widely accessible route to neptunium. This route allows a significant expansion in the number of neptunium molecules that can be synthesized and analyzed. This work into neptunium's behavior across the spectrum of its available oxidation states (which influence its behavior) is long overdue. Neptunium metal is extremely scarce, limiting its use as an entry route into molecular chemical studies. In contrast, aqueous acidic stock solutions of neptunium are available through dissolution of neptunium oxide, which is commercially available. Using this solution, researchers devised a new, facile synthetic access route to explore air-sensitive, non-aqueous neptunium chemistry in the +3 oxidation state. Specifically, they've demonstrated that a previously developed starting material in the +4 oxidation state can be reduced to neptunium(III) to afford a structurally characterized starting material of known molecular formula that can be isolated (as opposed to current in situ routes for which the exact nature of the starting material is not known). This new method helps provide a widely accessible entry point to neptunium(III) chemistry for any approved radiological laboratory. Synthesizing neptunium lets scientists elucidate details about the reduction-oxidation chemistry, bonding motifs, and electronic structure properties. Early studies using neptunium produced via this new synthetic route also note some key differences in reduction-oxidation stability in tetrahydrofuran between neptunium and plutonium. Notably, the scientists found that while neptunium(IV) is stable in tetrahydrofuran, plutonium(IV) is not and forms a mixed valent plutonium(III)/plutonium(IV) salt. The scientists conclude that this work might lead to the same level of advances as researchers saw early in 2000 when they developed a similar precursor for uranium.